USSR gas mask. During the threat of nuclear war the Soviet Union GP-5 gas masks were issued to citizens. Imagine sitting in a bunker, gas mask firmly secured over your face. Bracing for the moment when the bomb impacts the ground above. Exploding. Dirt and rubble blasting out in 360 degrees. When the fallout comes from nuclear war are you going to be prepared? Do you have your bunker dug out? Is it in the woods away from civilization? 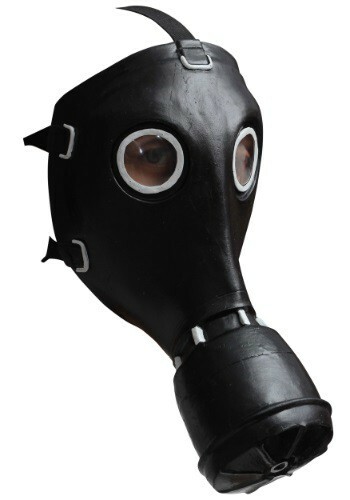 Do you keep one of these Black GP-5 Gas Masks on the wall? Ready to bust it out in case of the worst case scenario? Well this one is not exactly functional. But, then again the original had filters that contained asbestos. So, which would you rather have? Besides, this is pairs really well with some scrappy clothes for a great spooky Halloween costume.